Lot Size: 78x135 Square Ft.
Chimney Hill, an Edmond Community w/ walking trails, 2 neighborhood pools, park, basketball & tennis court. Formal living & dining room as you entry the home w/ great natural sunlight. Open floor plan w/ kitchen looking on to one of two living spaces. Kitchen has been updated w/ all newer stainless steel appliances. Spacious master suite w/ double vanities, whirlpool tub, shower, & walk-in closet. 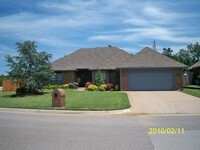 Corner lot w/ large back & side yard.